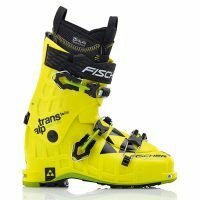 This year’s best Alpine Touring (AT) boots consisted of those that were lightweight while still providing a considerable amount of stiffness in ski mode and a generous cuff rotation in walk mode. We tested well over a dozen AT boots that we thought might be worthy of being called the ‘Best’ but narrowed the field to those that hit what we consider to be the ideal weight, fit, power, walk-ability and, versatility. 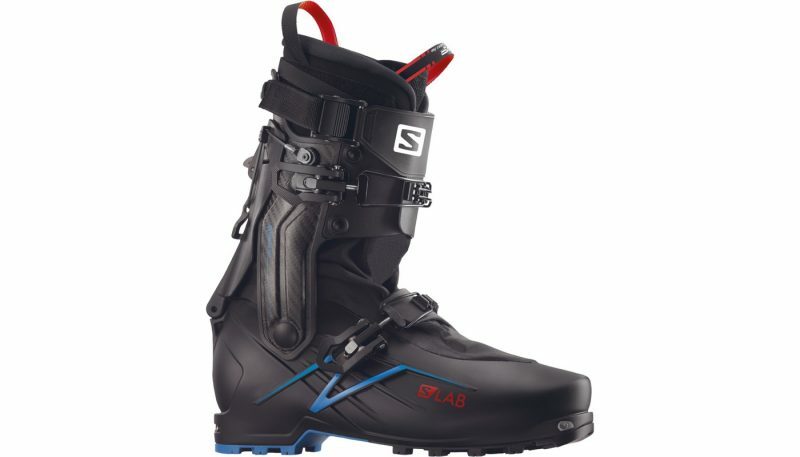 This meant that only AT boots in the 5- to 7.5 pound range with a cuff rotation of at least 50 degrees and a minimum flex rating of 125 (the Salomon S-lab X-Alp the exception here since they don’t discloses a specific flex rating) were considered. We also only considered AT boots which were new for this season and had an innovative design or used advanced materials and engineering. The final selection of boots were then skied multiple days at a resort and out of bounds on full day tours. The goal was to ensure that each boot encountered a variety of snow and terrain conditions while paired with the same Volkl Vwerk BMT 109 and Vwerk Katana skis. After logging several weeks in the backcountry, climbing thousands of vertical feet, and carving lap after lap of deep powder runs, our testers got to know each AT boot pretty well to identify their strengths and weaknesses. One trend that was apparent on more than half of the boots mentioned here is the use of an external walk/ski mechanism as well as the use of carbon and/or grilamid in the boot’s design in order to keep things light. Over the years AT boots have gotten lighter thanks to new materials and buckle designs that shave off precious ounces. 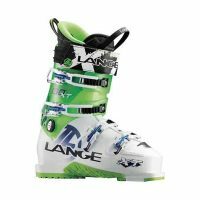 With a lighter boot, you generally get less performance so it’s crucial that they maintain their stiffness in order to drive the fatter skis preferred by backcountry travelers. While downhill performance is only one measure of success, the best AT boots need to also employ a large cuff rotation so that they provide an adequate range of motion on the up track so as to not impede your stride or efficiency. 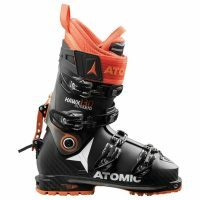 The Atomic Hawx UL XTD 130 boots are neither the lightest nor most comfortable ski touring boot out there, but they are a capable hybrid resort/touring boot for those who value performance. With a 130-flex rating, their 6.26 pound weight is impressive, especially for a traditional overlap construction boot. The Free/Lock 2.0 mechanism provides a quick and easy way to switch from ski to walk mode. With 54 degrees of cuff rotation, skinning is fairly fluid, but you will have to unbuckle the boot first. The buckles themselves are flimsy and do not remain fixed out of the way when you are putting on or taking off the boots. This, along with the Hawx UL XTD’s limited comfort make it feel more like an alpine ski boot that has been altered to tour, rather than a true AT ski boot like the Scarpa Maestrale’s. Comfort and fit are two very personalized features in any AT boot as everyone’s feet are unique and what may fit one person well may not fit another. Each of the boots tested was fit by a professional boot fitter and the same custom insoles were used to ensure that each boot had the same opportunity to perform well. My feet are somewhat average, having the requisite 5 toes on each foot, no abnormalities, and being slightly wide with a mid- to high arch. 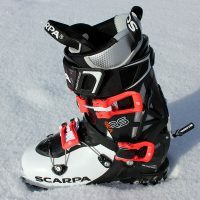 The best fitting and most comfortable AT boot tested was the Scarpa Maestrale RS. The middle buckle was ideally placed to seat my heel into the back of the liner and keep it stationary while the toe box was roomy and the liners comfortable. 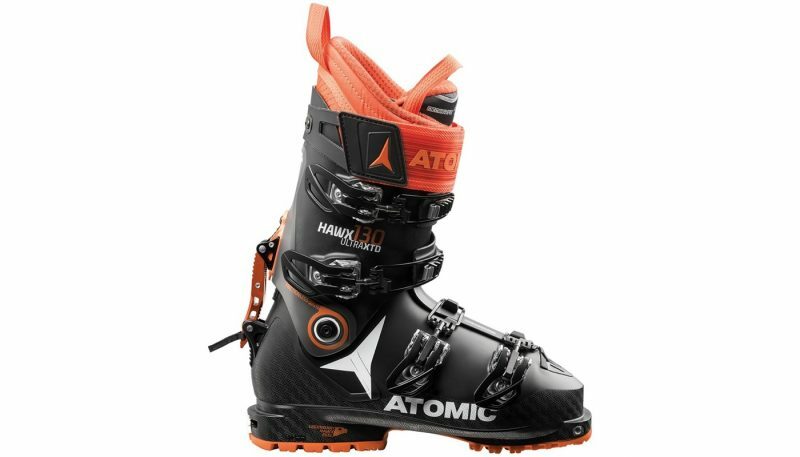 The Atomic Hawx UL XTD 130 boots were on the other end of the spectrum with more of a downhill fit thanks in part to their overlap construction and minimally padded liners. The volume of the Hawx UL XTD 130’s was also excessive compared to the others tested. 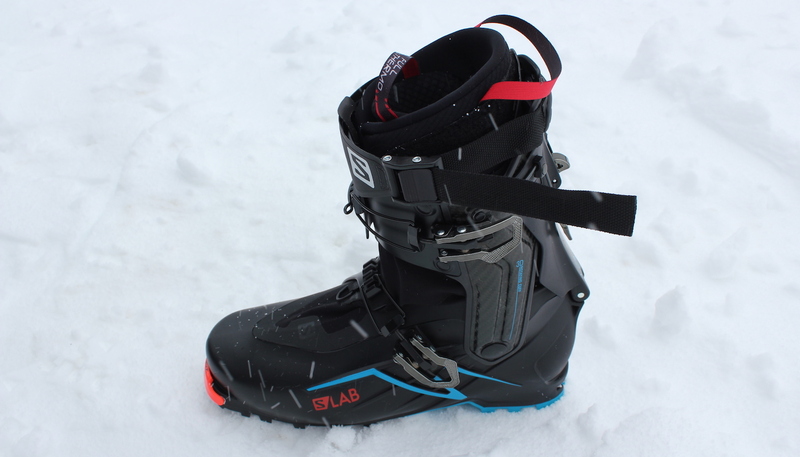 Similar to Atomic’s liners, the Salomon S-lab X-Alp boots had even thinner liners which did not offer enough support or comfort. Given that those boots only have two buckles (plus power strap), they didn’t keep my feet seated and supported well enough to fit comfortably. 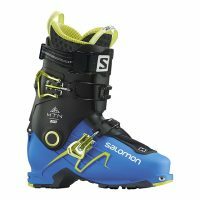 It’s not often you can award an AT boot a perfect 10 of 10 in this category, but the Salomon S-lab X-Alp Boots earned it with their svelte 5-pound weight. Most AT boots land somewhere in the six to the seven-pound range but Salomon’s innovative design (which was borrowed from their sister company Arc’teryx) shaves off a considerable amount of weight that is very noticeable with every step on the skin track. With weight reduction, however, comes a sacrifice of performance and the S-lab X-Alp’s light weight is also noticeable on the decent, but this is to be expected as this boot is a dedicated ski touring boot for long distance, big vertical and multiday backcountry sojourns. 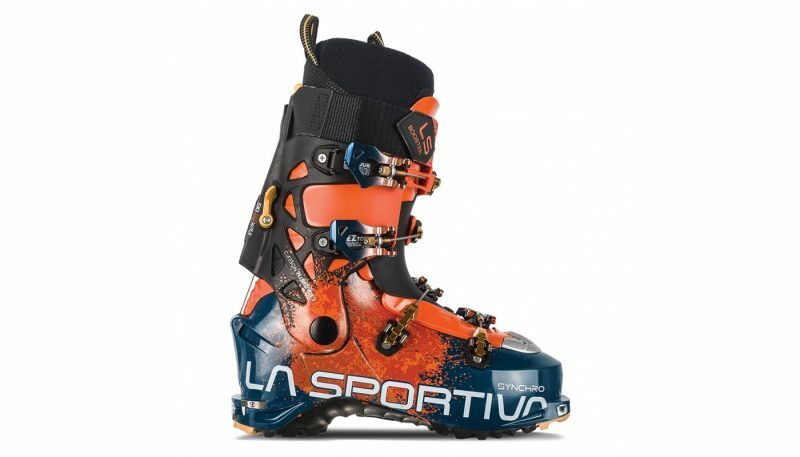 The Scarpa Maestrale RS and the Atomic Hawx UL XTD 130 boots weighed in with the second- and third-lightest weights respectively, while on the other end of the scale was the Dalbello Lupo AX 125 C boots. 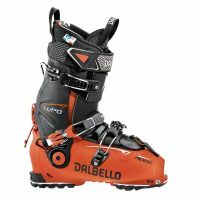 At over 7 pounds, the Lupo AX 125 C are by no means heavy, but relative to the rest of the boots that were reviewed and especially compared to the Salomon S-lab X-Alp boots, ‘lightweight’ is not a term that can be applied to the Lupo AX 125 C.
The Dalbello Lupo AX 125 C boots were the most proficient at transmitting power from boot to ski. Given their additional weight and progressive flex, they were very capable of driving a 115 millimeter ski in any condition. However, given that they were not as stiff as, nor as well fitting as the Scarpa Maestrale RS, I would have to place them second to the Maestrales in this category. It’s hard to beat this ‘best in class’ boot when it fits so well and also offers up a 130 flex rating. 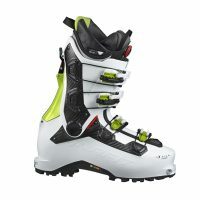 On the other end of the spectrum was the Salomon S-lab X-Alp boots. At just five pounds it’s hard to expect these boots to be a powerhouse, while they did perform well for their weight, they were no comparison to their heavier rivals. With only about 5 percent of the time you’re ski touring actually spent skiing, and the other 95 percent spent walking uphill, it’s easy to see why an AT boots’ walk-ability is so important. The biggest metric for determining how well an AT boot walks is cuff rotation, a measure of how much range of motion or flex a boot has in walk mode. The winner in this category has to go to the S-lab X-Alp, even though Salomon has not officially published a cuff rotation value. It’s easily more than the human ankle so it’s obviously more than adequate. 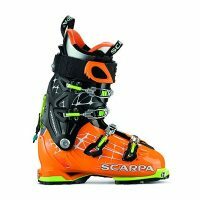 The Scarpa Maestrale RS boots’ 60 degrees of cuff rotation is a solid runner-up and given that they offer up more versatility I would have to call them the winner. 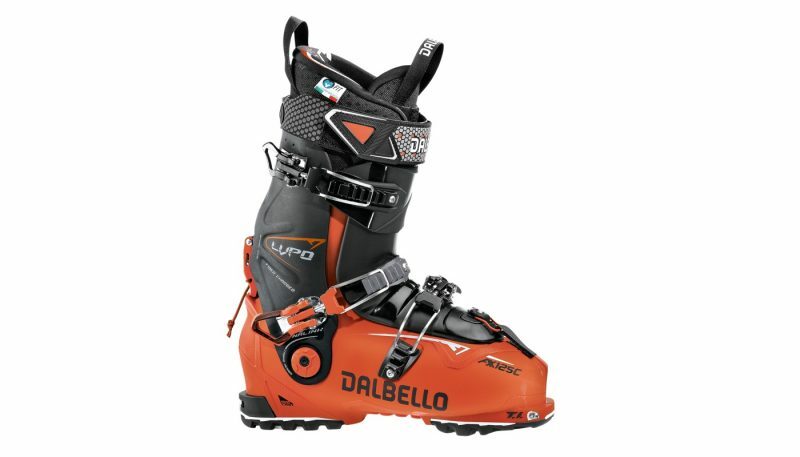 The Dalbello Lupo AX 125 C have a reported 67 degrees of cuff rotation but this is only achieved by removing the boot tongues so this would place this boot in second place. Following this is the Atomic Hawx UL XTD 130, with 54 degree range of motion. However, all of the buckles and the power strap need to be undone in order to achieve this amount of cuff rotation. Conversely, the La Sportiva Synchro AT provide 50 degrees of flex and most of this can be enjoyed without having to fully unbuckle the boot with most others simply cannot do. 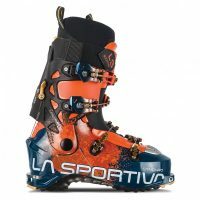 The most versatile AT boot tested was the Scarpa Maestrale RS followed closely by the La Sportiva Synchro. 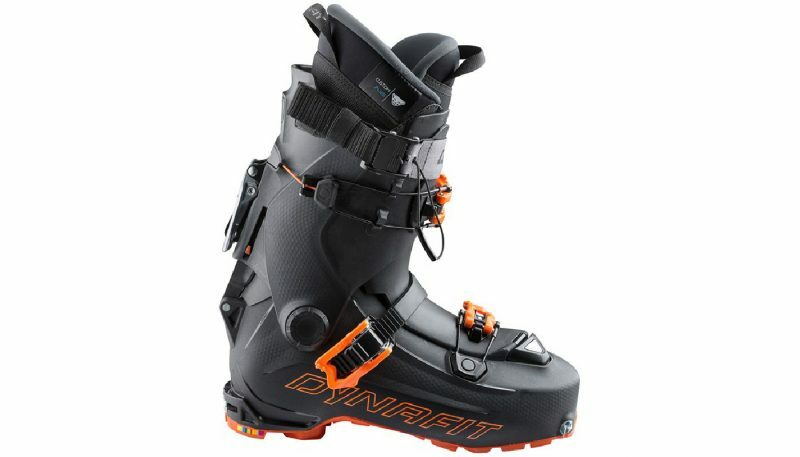 Both these boots possessed enough stiffness to charge hard on challenging steeps and groomers while still being light enough to spend a full day out in the backcountry mining powder lines. Switch them over to walk mode and they both had enough flex to churn through the vertical on the skin track with ease. While the Scarpa Maestrale RS were stiffer with a 130 flex to Dalbello’s 125, they were also lighter by a full 6 ounces per pair. Hands down, the Maestrale RSs win — but the Synchro are a close second. At the bottom of the versatility pile would have to be the Salomon S-lab X-Alp. 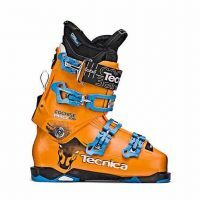 These boots were simply too light to offer up enough support and performance on groomers and drive confidently through variable snow conditions. Because the S-lab X-Alp boots earned the highest marks in the lightweight category it also meant that they are more of a one trick pony. 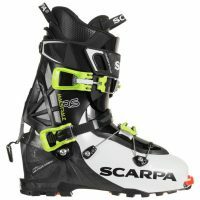 The overall top dog in the battle for AT boot supremacy was easily won by the Scarpa Maestrale RS AT boots. The Maestrales outshone all of its competitors because they had the most to offer, scoring higher in every category except lightweight and walk-ability. These two categories were taken by the Salomon S-lab X-Alp boots, given their off the chart cuff rotation and minimal weight. The takeaway here though is that the lightest boot is not necessarily the best. Sure the S-lab X-Alp can climb like there’s no tomorrow and make you feel as if you are wearing slippers, but it is a one-trick pony. Whereas, the Maestrale RS boots did everything well and was sometimes the overall best in a category. They were the most comfortable, powerful and versatile boots tested which means that they will have mass appeal to more of the average backcountry skier out there like you and me. The Scarpa Maestrale RS boots also employed two design features that you’ll no doubt begin to see more of in future AT boots. Namely, an external ski/walk mode and a single buckle that uses a cable to do the work of two buckles, thus saving weight and making the buckling process that much simpler while not sacrificing fit. Both of these features simplify a boots complexity, proving once again that less is more. Keeping things simple helps reduce material fatigue and failure while reducing weight in the process, so it’s a win-win all around. 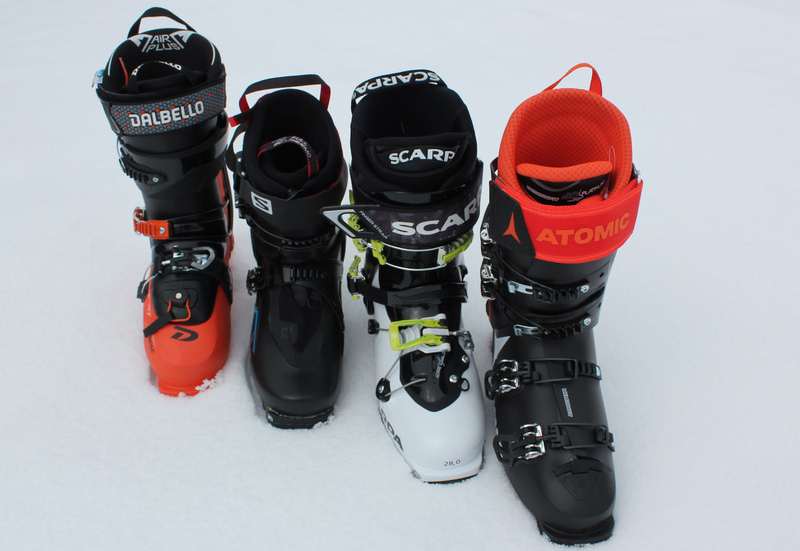 Each of the boots mentioned above were tested for multiple days inbounds at a ski resort and out of bounds on backcountry ski tours. The objective was to ensure that each boot encountered a variety of snow and terrain conditions so that their fit/comfort, weight, power, walk-ability and versatility were adequately tested. In order to properly judge the fit and comfort of an AT boot, you must first have it properly fitted by a quality boot fitter and then give it several days of use so that it can be worn in over time. This means that several thousand vertical feet must be ascended, multiple miles walked and countless descents enjoyed. 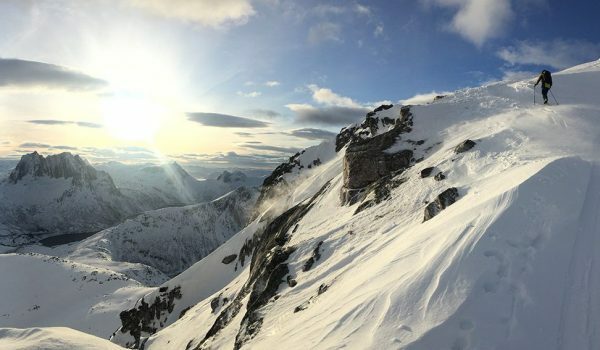 Walkability is of utmost importance since 95 percent of the time in the mountains ski touring is spent walking uphill. It is imperative then that a boot has a large enough cuff rotation so that it does not impede your natural cadence or rhythm. While an AT boot’s light weight is easily appreciated climbing a skin track, it is typically proportionate to the power they provided on the ski down. 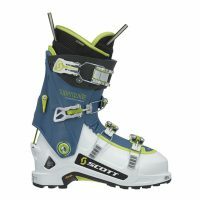 As weight decreases so does the ability of AT boots to drive a fatter ski through challenging terrain and variable snow conditions. The secret is to find an AT boot that is not too light, nor too heavy so that it can provide the performance you require on the up and the down. This is typically a combination of a high flex rating and cuff rotation, however, more weight is typically required in order to achieve a stiffer boot which can then impede cuff rotation. 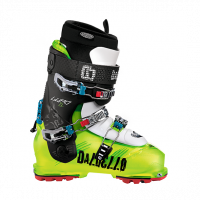 Cuff rotation, flex, weight and comfort all combine to determine if an AT boot is more adept at shorter slack country routes and resort skiing or long multiday ski traverses. 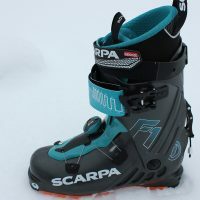 If however an AT boot is more proficient at one of these things than the others, it then means it is less versatile overall for the average backcountry skier who really wants an AT boot that can do it all. 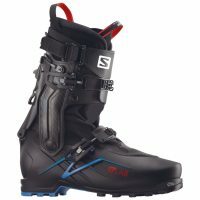 What is an Alpine Touring Boot? 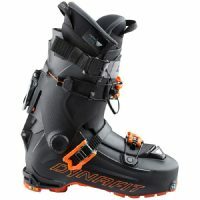 Alpine Touring (AT) boots are similar in design to Alpine Ski boots, except AT boots will feature a built-in walk mode, a wider/more aggressive tread, and sometimes tech fittings in the toe and heel to accommodate a lighter weight touring binding, or “tech binding.” Lightweight AT boots are best suited to longer ski touring days, multiday traverses, and skimo racing (ski touring on a race course against other competitors). Heavier AT boots, on the other hand, are suited to those who like to ski hard and require more durability from their boots. This kind of AT boot is ideal for day trips or slackcountry laps (the easy-to-reach backcountry just beyond the boundaries of a resort). 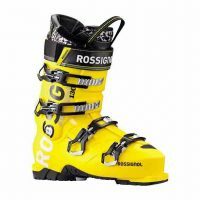 These boots can also be used on groomed runs at the ski resort when needed. Alpine Touring boots incorporate a lot of high-tech materials and innovative buckle and walk/ski modes into their design. 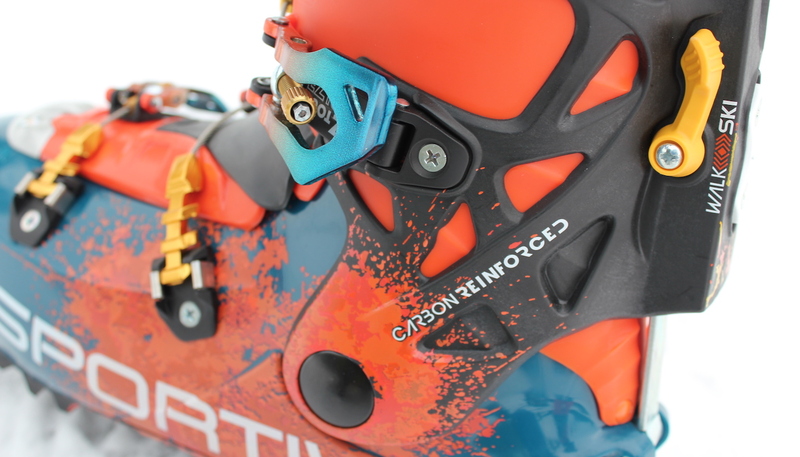 This is to limit weight and maximize strength and performance so these boots can better drive a fat ski in challenging terrain. Because of this, the price for a high quality AT boot continues to rise. You will likely pay on average $900 for a new AT boot from a reputable brand. The boots in this test ranged from a low of $800 to a high of $1,000 with an average price of $880. Be forewarned though, a higher priced boot does not necessarily mean better performance and fit.